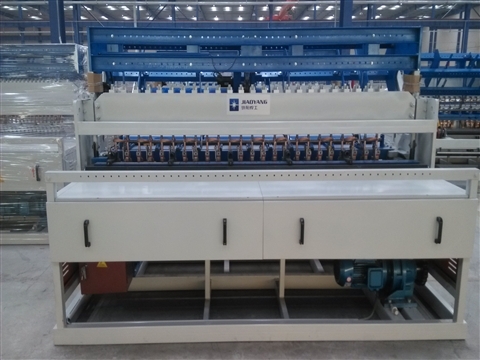 The construction galvanized mesh welding machine is a mature welding mesh equipment in China.At present,more and more customers choose to build welded wire mesh machines for steel plate welding.However,the price of automatic mesh machines is different in the market,and the prices are different.At the same time,we also considered the cost performance of the equipment. The quality of the high-efficiency welder is slightly higher and the size of the manufacturer is limited.The price of parts is different in configuration,service and even after sale.The welding quality and output of welding equipment is the first,and the benefit is the ultimate goal of investment. Construction galvanized mesh welding machine helical gear reducer:In order to ensure the high load operation of the equipment,the K series helical gear reducer with high torque carrying capacity is adopted,and the external installation ensures the convenience of maintenance. The welding mesh size of the construction galvanized mesh welding machine is accurate,and the development speed of the construction mesh welding mesh machine industry is getting faster and faster,and the process is continuously improved.As a medium and high-end welding machine,Jiaoyang is a customized enterprise,the welding machine is continuously optimized and upgraded,and there are many models of automatic welding machine.We recommend that customers meet the welding needs.We recommend that customers provide parameters such as welding materials,use and welding specifications to facilitate the quotation and quotation of the welding machine.